This yoghurt custard with mixed berries is a guilt-free dessert to wrap up your dinner. It can be made on the go. I like all sorts of berries, blueberries, strawberries and raspberries. Not only they have amazing health benefits with lots of antioxidants that can boost our immune system, but also they are juicy and tasty. 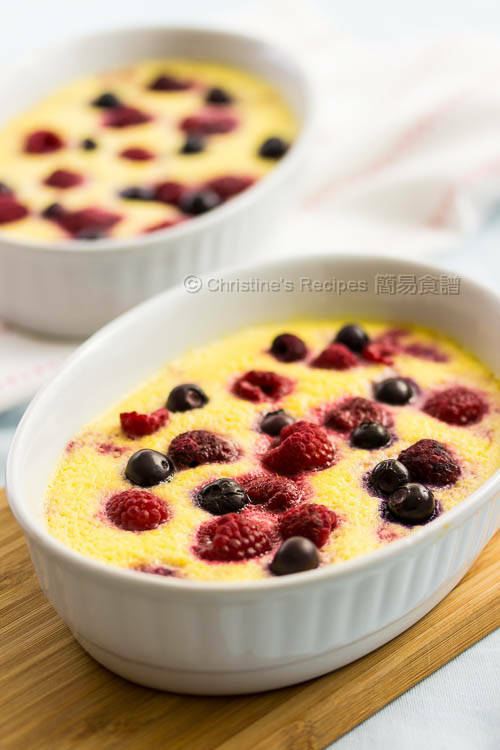 With some berries, this baked custard was turned into a very balanced delicious dessert to wrap up my dinner. The dessert was even more superb by adding some yoghurt. It’s absolutely a guilt-free dessert. It can be served warm or cold. Yet I couldn’t wait to taste, so it’s gone in a few minutes once it’s out from the oven. 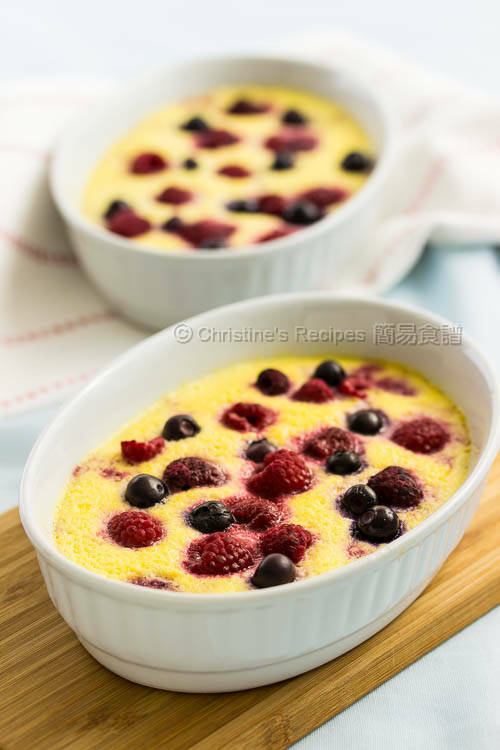 With some berries, this baked custard was turned into a very balanced delicious dessert to wrap up my dinner. The dessert was even more superb by adding some yoghurt. Preheat oven to 160C / 320F. Lightly grease two 350ml-capacity baking dishes. Heat milk in a small saucepan until almost boiling. It’s ready when white smoke arises. With an electric mixer, beat the eggs with sugar until thick and pale. Mix in vanilla extract. 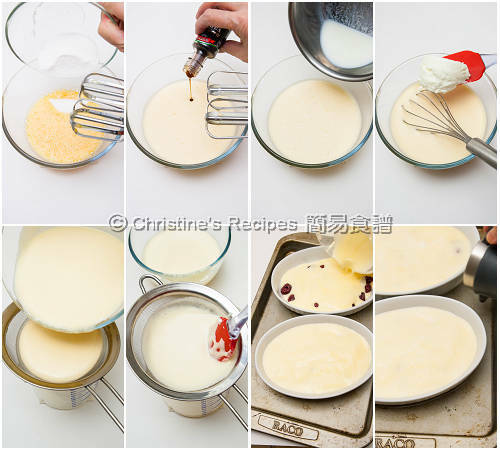 Gradually whisk the hot milk into egg mixture. Add in yoghurt. Mix well. Strain through a sieve into a large measuring cup or jug. Place the two baking dishes in a large roasting pan. Scatter some berries in the two dishes. Pour in the egg mixture. In the large pan, pour hot water to halfway up sides of the dishes. Bake in the preheated oven for 25 to 30 minutes. 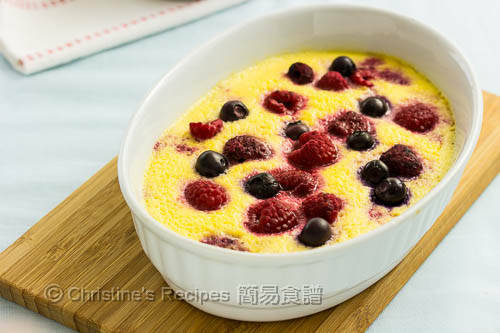 After baking for about 10 minutes, or until the surface starts setting, carefully remove the pan from the oven and sprinkle some more berries on top. Continue baking until custard is set around edges but still slightly wobbles in center. Serve hot or warm. Plain yoghurt is unsweetened with a slightly tangy flavour, perfectly balanced with the sweetness of custard. You may use any kinds of berries that come in handy, like strawberries, raspberries, blueberries or black berries. Don't scatter too many berries on the bottom of baking dishes. Otherwise the water inside released will make the custard watery. I used fresh milk. You may use evaporated milk instead if you like. The custard will be thicker and creamier though. Hi Christine, is it safe to use frozen berries in Australia, given the recent hepatitis scare? I read about the frozen mixed berries recall news too. The contaminated products were imported from China. I didn't use that brand. Often use the products made in Australia.